It seems only fitting that I started PL 2013 Monday, what with Lisa Bearnson making her debut on HSN to promote Project Life the same day....lol. I certainly didn't plan it this way *wink* I had always intended to do PL this year, just a slow starter as always...lol! 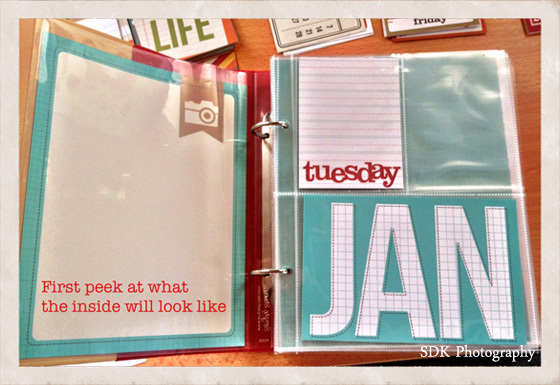 I've chosen to do PL using Simply Stores - Sn@p Life 6x8 Album in RED... my fav colour! I got super serious about two weeks ago and ordered heaps of pockets and journal cards... which all arrived Friday! Plus I have downloaded a few free digital goodies from various place on the Net. This is what I am using for all my journaling this year. I know I have mentioned it before but this really is an awesome little app. Not only do I make an entry for each day but I have been attaching photos taken, then the app adds in my facebook and blog posts made on those days as well. When I am ready to access the info for PL, I just export the file to my computer and sort the info into the relevant folders. 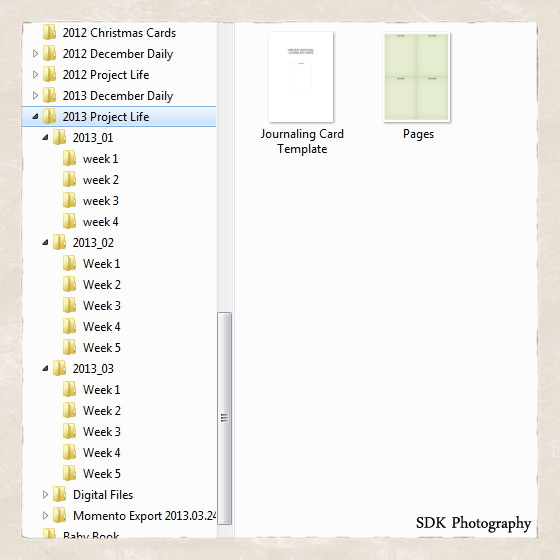 OMGosh this has saved sooooo much time, I spent today - just ONE day organizing the entries for THREE MONTHS! And yes the whole album has been put together ready for photos, journal cards and embellishments. I know the layout may change as I go along but I tell ya it is so awesome to have the album ready to go. 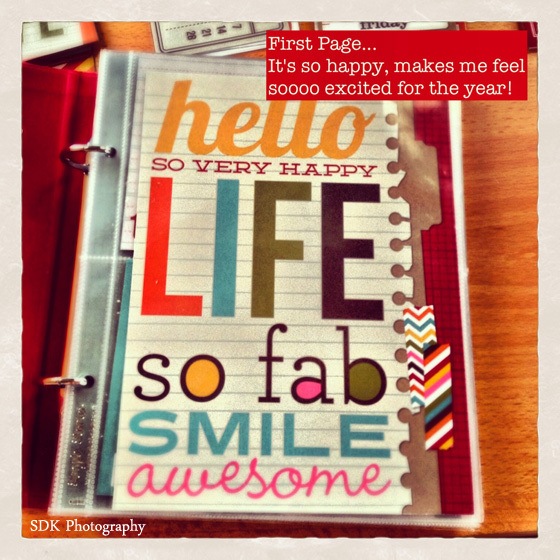 I really, really feel I will be able to keep up this year, which is a bit exciting and encouraging ...lol! 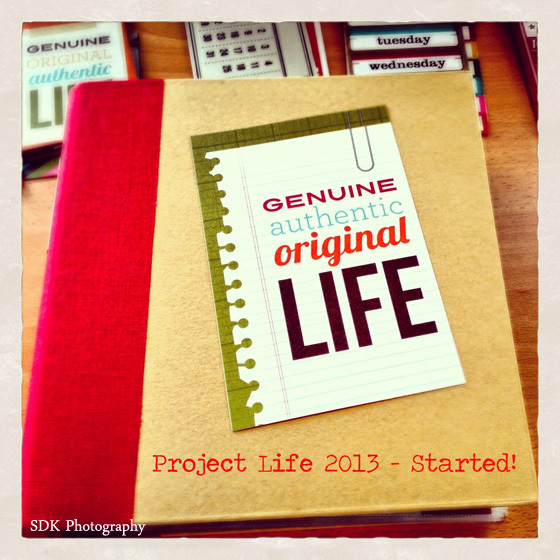 So how is your Project Life coming along, got and hints or tips for me? Help!!! I fallen into a horrible trap... I spend so much time looking at other crafty peoples projects, for ideas and inspiration that I don't spend much time crafting. I have sooooo many craft supplies I need a bigger house... no seriously it's an addiction that I feed by telling myself that I am going to use everything I buy, honest I will. Online shopping will keep me poor at the rate I buy craft products... must.have.the.latest.new.product...aaaack! I just have no will power to STOP!!! Still I'm sure I not alone...hahahaha. To help me in my efforts to do more crafting and spend less time looking, each time I see a tutorial or technique I think.. oooo I would like to try that - I am going to make myself doooo itttttt!! Right then and there!!! No more saying I will do it another day!!! BAM project complete!!! 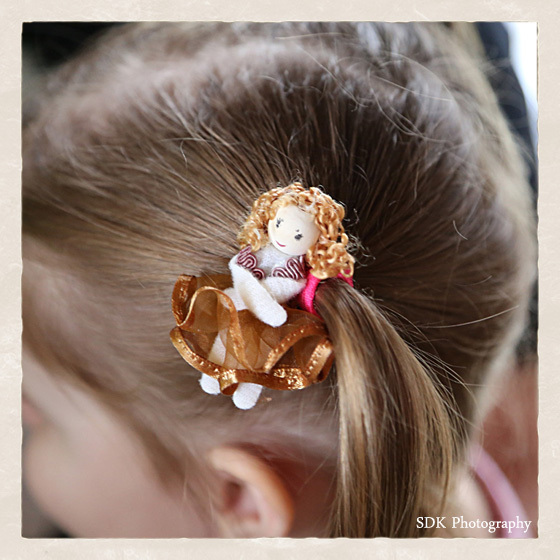 So I saw this tutorial on the Silhouette Blog... 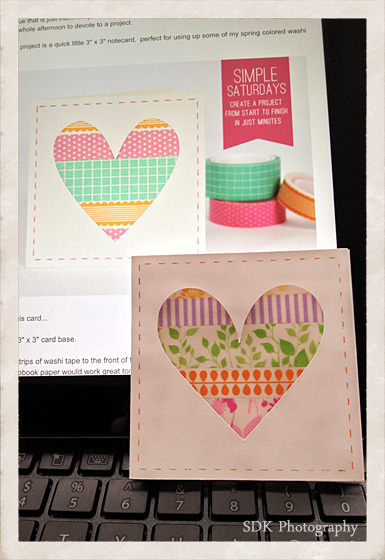 Simple Saturdays: Small Notecard ...aaaannnnnd did it!!! Took me all of about 10mins from go to woe. I used my sketch pens for the first time ever since I bought my Silhouette over a year ago. 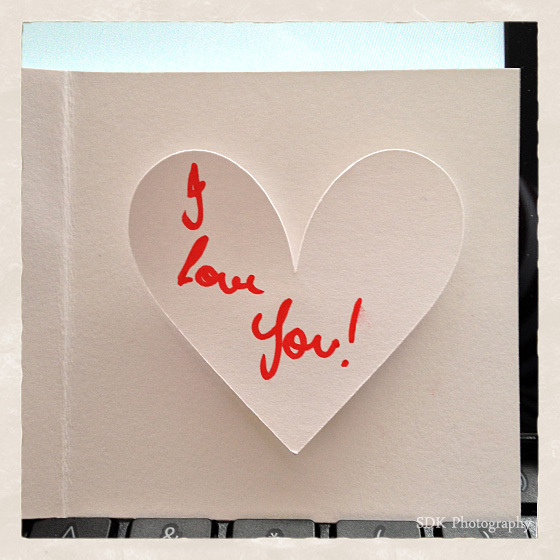 Made a cute little note card and the negative heart that was cutout went inside the card. A bit of chicken scratching I call hand writing on it and I popped this on Hubby's computer keyboard for when he comes home. So, who hasn't heard of Couture Creations... No! Well let me tell you they make the most brilliant Embossing Folders. I love all the patterns and the emboss is really nice and so deep, you just want to run your fingers over it :) Oh and now they are making Dies as well, the Doily Dies are awesome! Plus they are an Australian company and I love to support anything Australian made, especially if it just so happens to feed my craft addiction *wink*. At the moment Couture Creations are giving away a prize to celebrate the selection of their very first Design Team...YAY and congratulations to all the DT ladies!!! To be in the running to win the prize, all I had to do was sign up for their newsletter to get all the details. And what a prize it is... a full set of (ten embossing folders... yes I did say 10) 5x7 Fresh & Fun Embossing Folders - click the link to check them out. 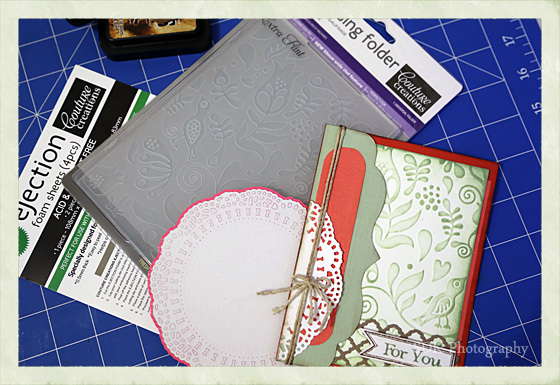 I used the Extra Flint Embossing Folder and the Tranquil Lace Doily Die. 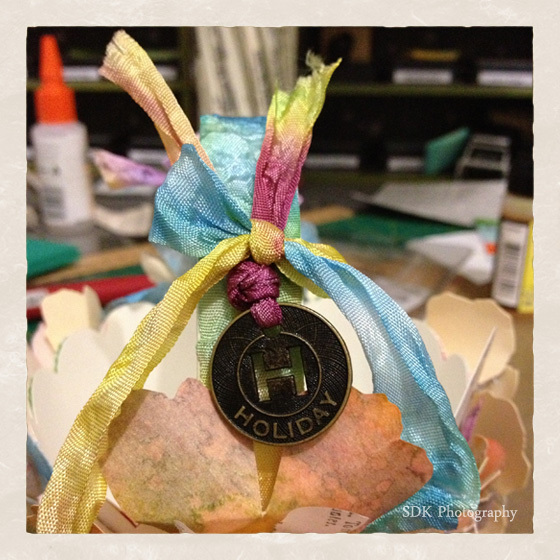 A tip I picked up from one of the lovely DT ladies - Liz Weber, was to use ejection foam with the Die. What a difference it makes and a huge time saver, no more trying to hook little bits out of the Die after use...WOOT! 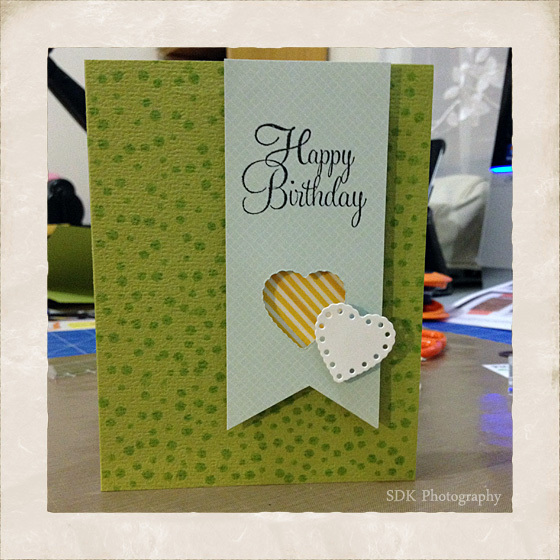 A lovely little card that didn't take long to put together and perfect for the next family member who has a birthday! 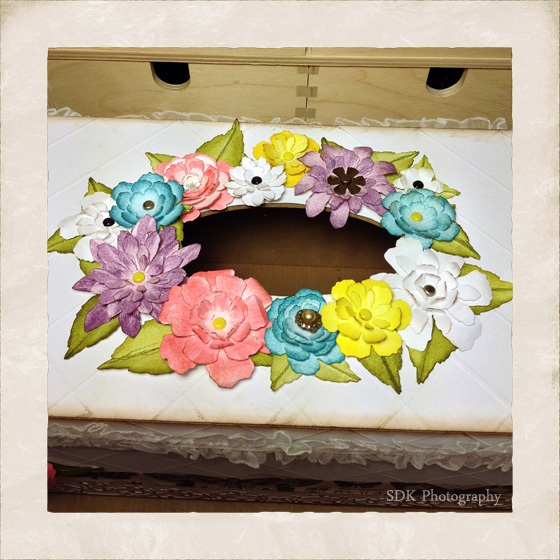 I Did It - Tattered Floral Challenge! So excited!!! I decided awhile ago I need to participate in more challenges to use the ever growing stash of stuff that seems to make it's way into my craftroom *wink*. 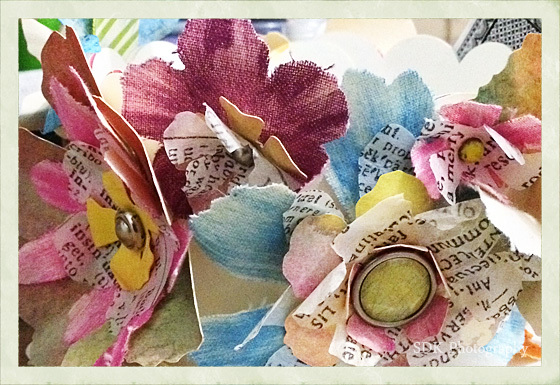 I got my Tattered Floral Die Wednesday which meant I still had time to make something for Tim Holtz - Tattered Floral Challenge! 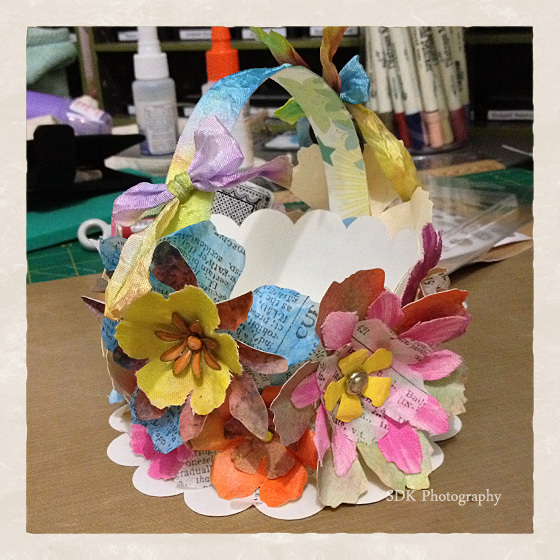 Aaaaaaand here it is... A pretty little Easter Basket! I used distressed inks and stains and paint and brads and metal flowers and stickles and tissue paper and manila card and calico... phew! The manila card stock was dragged through a bit of stain and dried, before I add some inks and dried. A bit of spritz and flick with water to get the mottled look... then spritzed with Perfect Pearls - Biscotti and dried before die cutting. I die cut the calico pieces first. Distress paints are awesome when applied to calico, the colour is intense and if you stroke them across the fabric you get this effect! 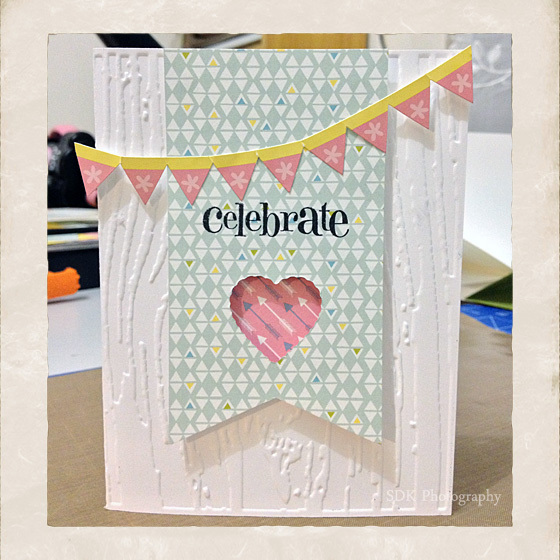 Card Me Thursday - A Stamper I'm Not! I try, I really do but it's just not a crafty thing I have ever mastered. 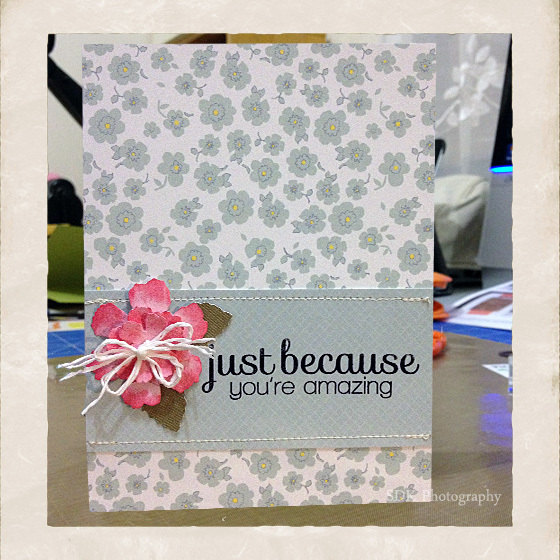 Here is a run down of my latest stamping disasters... 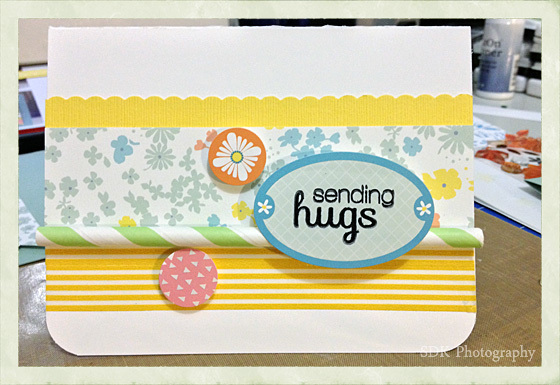 I purchased the Simon Says Stamp March Card Kit, included was a cute clear stamp set. The kit arrived Friday but I had to wait until Sunday before I could play, this was good as it gave me time to have a look at what the Design Team had done with the kit. Card no.2 - original by Nichol Magouirk . A kraft card stamped with white ink. Let me just say right now I clean my stamps after each use. This was the first time I had used white ink and I was rather excited to see it on some cardstock. 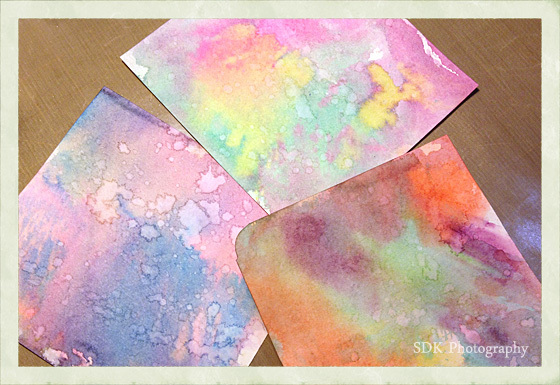 Placed a stamp on a block and lightly tapped it on the ink pad... the pad slowly turned pink...eeeeek! Yep the residual red ink was coming off onto the pad :( So I cleaned and cleaned and cleaned the stamps I had inked red, short of scrubbing them and STILL the red came off on the white ink pad *sigh*...NEXT! Card no.3 - original by Lucy Abrams. This started well, I managed to cut the papers and stitch them together. Next stamp a simple sentiment in black ink on the stitched strip... aaaaaaaand I didn't press hard enough again and only got a partial image. Unpick the stitching, cut another strip of contrasting paper, stamp again... HURRAH! success this time and stitch onto the front of the card! Card no.4 - picture of the original supplied in with the kit. Yep... the sentiment got double stamped coz I moved the stamp -ackkkk! 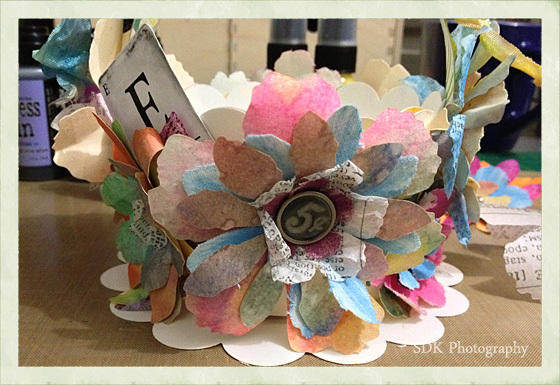 Card no.5 - original by Shari Carroll. 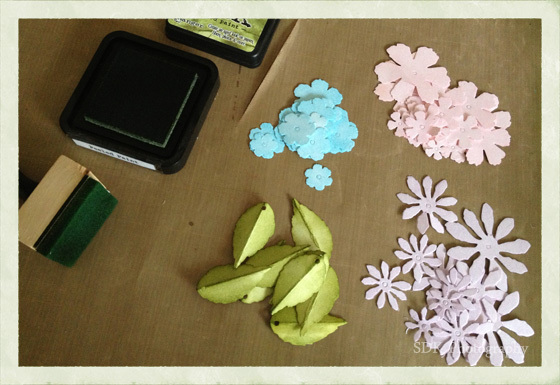 Here you can see the defect in the flower stamp, not my doing this time...hehehe and the good folks at Simon Says Stamp are replacing it, they are an awesome company to deal with! But again I didn't press hard enough when stamping the leaves and didn't get a clean image. 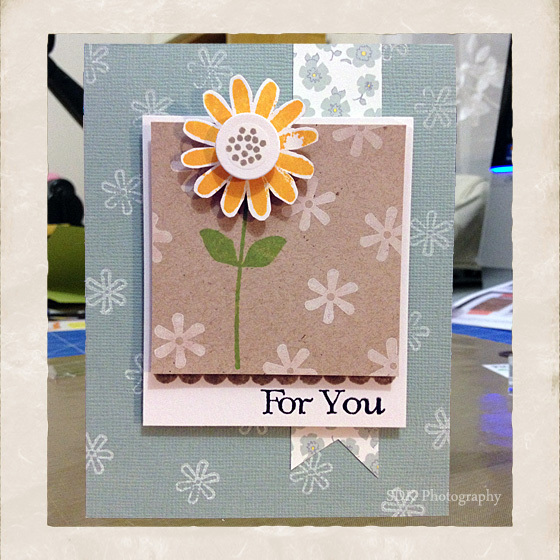 The rest of the card went OK, apart from the dodgy cut job on the flower...lol, I love die cutting for this reason! Kelly Marie Alvarez. I used stamps from another set for the sentiments and I'm happy to say these ones went quite well...hahaha. I did have a good laugh at myself as I was making these cards, in the end they all turned out OK despite my ineptitude with stamps and ink. If anything my efforts have spurred me on to try more stamping and eventually I will get the hang of it... I've always love a good challenge *wink*. 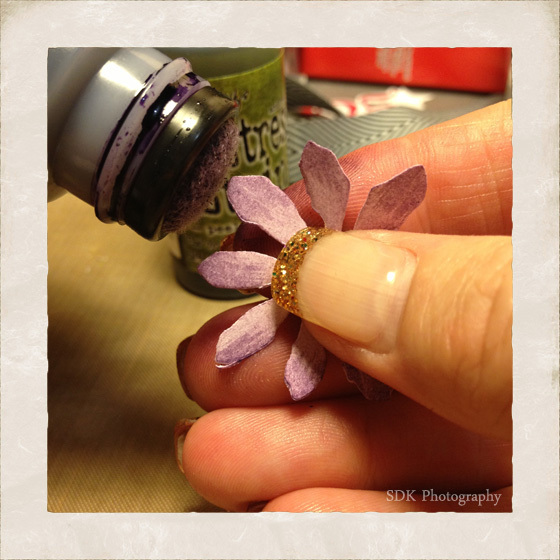 I decided to take up the challenge Tim Holtz had on his blog at the beginning of the month... create something with his Tattered Floral die... yeah I'll be in that! 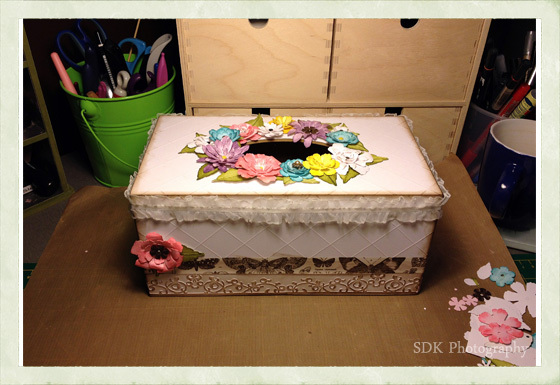 I have had a wooden tissue box in dire need of decorating for sometime and flowers are always a nice addition. So off to my craft room I went only to find I didn't actually have that die *insert sad face* but I did have the Tattered Flower Garland die. Although it meant I couldn't enter the challenge on Tim's blog, it didn't stop me for challenging myself instead. 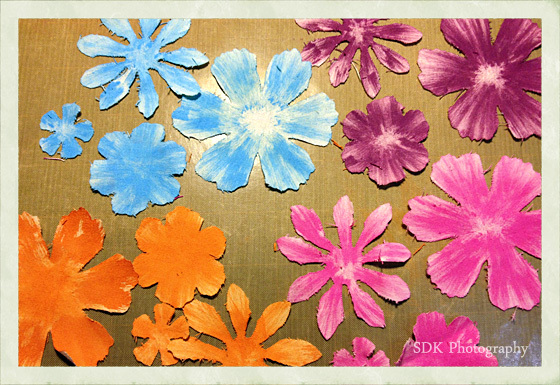 To give the flowers a little more detail I stroked the edges of the petals with distressed stain in a darker shade of each colour. This method of applying the stain gave a nice stripe effect to the edges. I cut strips of white cardstock to fit each side of the box and scored them on the diagonal before gluing on. Then I cut thin strips to go around the bottom of the box, these were embossed with the Couture Creations: Annalee (Romantique Collection) Embossing Folder then distressed ink rubbed over the top. Once the strips were glued in place, I added a bit of tissue tape above, a bit more distressed ink on all edges and some ruffled ribbon around the top edge. I folded each leaf in half too before applying distressed stain. 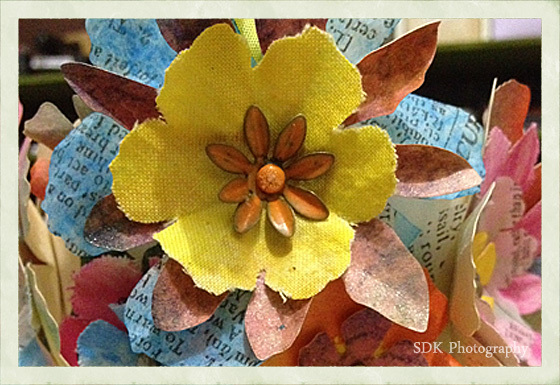 The flower layers were joined with different types of brads, then the petals of each layer were either curled or pushed into place. 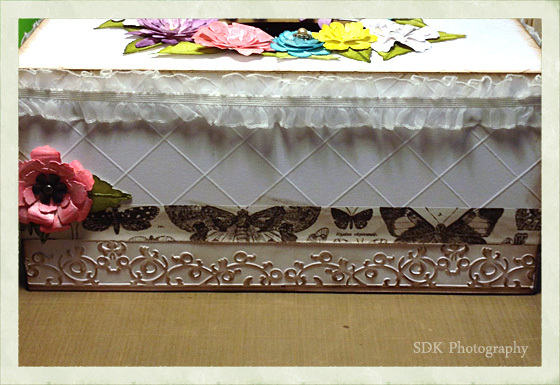 Once I was happy with how they looked, the flowers and leaves were glued to the top of the box. I had a spare flower with made a nice little addition to the front of the box and myself challenge was complete! A pretty addition to my lounge room and too fun to make.